Queen Elizabeth II departs the Commonwealth Service on Commonwealth Day at Westminster Abbey on March 11, 2019 in London, England. The Commonwealth represents 53 countries and almost 2.4 billion people and 2019 marks the 70th anniversary of the modern Commonwealth, enabling cooperation towards social, political and economic development. 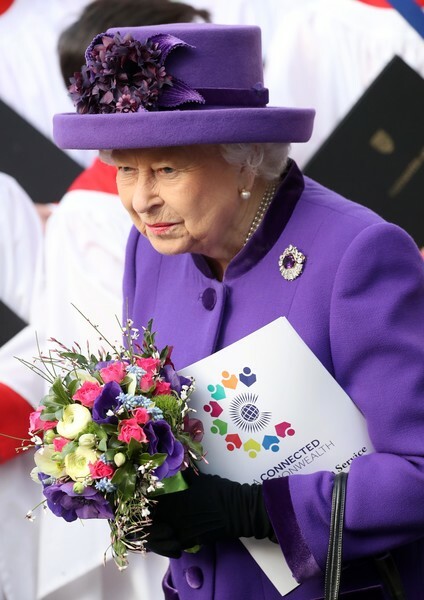 Queen Elizabeth II wore a flower-adorned purple hat to match her coat at Commonwealth Day 2019. Queen Elizabeth II paired her coat with a dazzling gemstone brooch.